Right size and cost optimize your IT environment with end-to-end Capacity Management. CA Capacity Management is architected to help you gain a deeper understanding of your near and long-term capacity needs, optimize asset utilization and cut your costs. This fully scalable solution provides end-to-end, cross-enterprise support to create an accurate picture of your infrastructure, suggest configuration changes and help you make more informed business decisions. 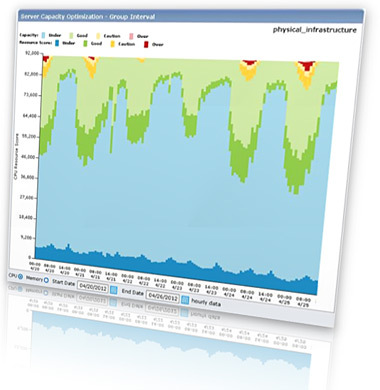 CA Capacity Management helps you maintain higher service levels across high-volume physical, virtual and cloud environments while helping to reduce capital expenditures and operating expenditures associated with hardware, software, power and cooling. In addition, it can help you manage constant IT change with tools that predict the impact of workload increases, architectural changes or new application deployments. Plan for capacity more accurately. Assess server consolidation candidates to help reduce energy, license, maintenance and other operating costs while maintaining service levels. Understand how re-hosting, consolidation and workload stacking will affect application performance. Evaluate virtualization alternatives such as hardware vendors, hypervisors, system configuration, operating systems and VM size for prescriptive migration efforts. Identify cost saving opportunities and solve for business objectives such as lower TCO and optimized capacity in conjunction with reserved capacity for future projects. Understand ideal physical, virtual and cloud placement, in addition to configuration settings, required to support expected demand changes. Achieve better alignment between IT capacity planning and business. Reduce capital and operational expenditures. Understand future workload needs and reduce risk. Achieve a better balance among application performance, cost and risk. Plan for capacity more accurately with a predictable IT budget.